A lot of memories from my childhood are around food and every time I eat Dahi Vada, I always think of a time when we used to visit the Shani temple in Matunga quite often. The best part of the trip were our visits to Anand Bhavan – a South Indian joint near the King Circle flyover, where I would always order Dahi Vadas. 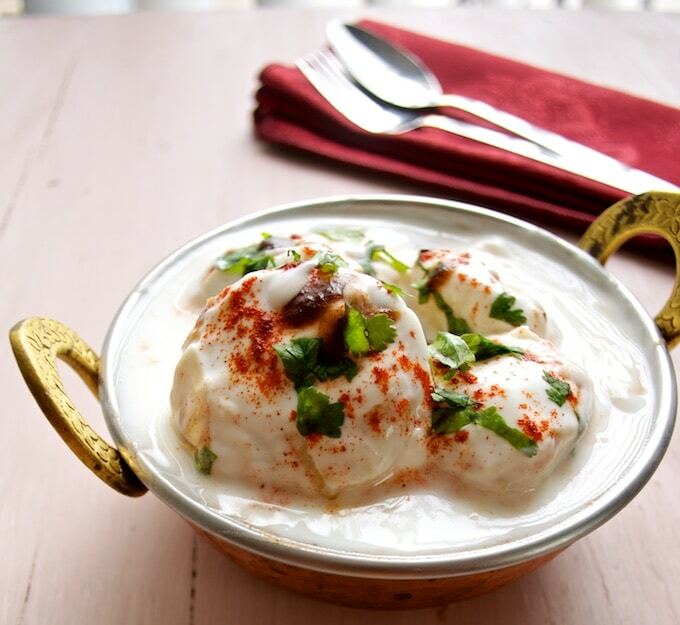 Dahi Vada also called as Dahi Bhalla is prepared by soaking vadas or lentil dumplings in yogurt. The yogurt they served at Anand Bhavan had this silky texture from being well beaten and the vadas would be so soft that they would just melt in your mouth. These vadas are typically deep fried and put in water to soak for 15- 20 minutes to soften them. Vadas are then squeezed between the palms to get the water out of them and then they are transferred into the mixture of sweetened yogurt. Coriander leaves, chilli powder, crushed black pepper, cumin powder are sometimes used for garnishing along with a combination of coriander and tamarind chutneys. Soak the urad dal overnight. Rinse and drain the water completely. Grind the urad dal, green chillies, ginger and salt into a thick coarse batter using as little water as possible. Transfer the batter into a bowl. Add fruit salt to the batter and pour a teaspoon of water over it.When the bubbles start to form, stir the batter gently to incorporate the bubbles. Grease the cups on the appam pan with oil.Place the appam pan on medium to low heat and add a spoonful of batter to each of the cups till they are 3/4th full. Cover the lid. Let it cook for 3-4 minutes and when cooked, turn over the vadas using a spoon and cook on the other side as well. Alternate method: If not using the appam pan, use a kadhai / wok to deep fry the vadas in hot oil kept on medium heat. Allow the vada to cook until golden brown on one side and then flip to the other side and cook again.Repeat the process until you run out of batter. Whisk the curds,sugar,salt and milk well to blend them together. The yogurt should be of pouring consistency. Refrigerate the yogurt mixture until you are ready to serve the vadas. Right before serving, soak the vadas in a bowl of water for 5-10 minutes, drain and squeeze the vadas gently to remove water. Arrange the squeezed vadas on a serving plate and pour the refrigerated yogurt over till the vadas are completely submerged. Sprinkle chilli powder and cumin seeds powder. Serve immediately garnished with coriander and accompanied by coriander and tamarind Chutneys.